What is the diversity question in a school application, and more importantly, why does it matter when applying to leading programs and universities? Many applications now include a question – sometimes optional – that encourages applicants with minority backgrounds, unusual education, distinctive experience, or unique family histories to write about how these elements will contribute to the diversity of their target school’s class and community. If you are an immigrant to the U.S., the child of immigrants, or someone whose ethnicity is a minority in the U.S., you may find your response to this question to be helpful to your application effort.. Why? Because you can use it to show how your background will add to the mix of perspectives at the program you are applying to. 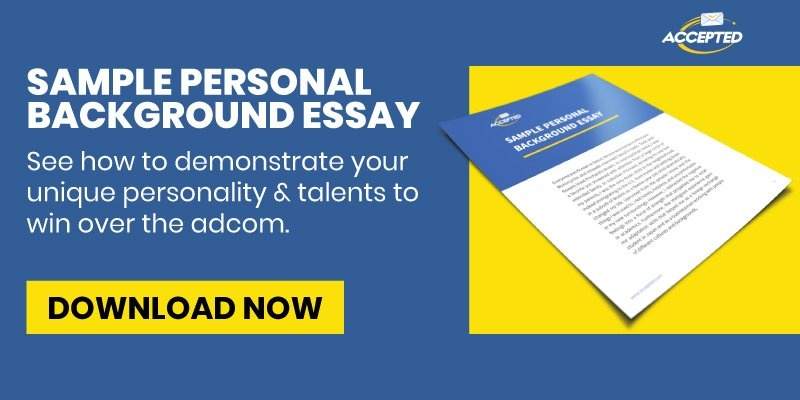 Download this sample personal background essay, and see how one student won over the adcom and got accepted into their top-choice MBA program. Of course, if you’re not a minority and don’t fall into one of those categories, that doesn’t mean that you don’t have anything to write about. If you are applying to a school and have an unusual or special experience to share, like serving in the military, becoming part of a dance troupe, or caring for a disabled relative, use your experience to convey how you will bring diversity to the school’s campus. You could be the first member of your family to apply to college or the first to learn English in your household; you could have worked your way through college or raised your siblings. As you can see, diversity is not limited to one’s religion, ethnicity, culture, language, or sexual orientation. It’s whatever element of your identity distinguishes you from others. Why Does Diversity Matter at School? Admissions officers believe diversity in the classroom improves the educational experience of all students. The more diverse perspectives found in the classroom, throughout the dorms, in the dining halls, and mixed into study groups, the richer the discussions will be and the more creative the teams will become. Plus, learning and growing in this multicultural environment will prepare students for working in our increasingly multicultural and global world. In medicine, for example, a heterogeneous workforce benefits people from previously underrepresented cultures in medicine. Businesses realize they will market more effectively if they can speak to different audiences and markets. Schools simply want to prepare graduates for the 21st-century job market. Listen to our podcast and find out how to approach diversity in your application. Adcoms want to know about your diversity elements and the way they have helped you develop particular character and personality traits, as well as the unusual experiences that have shaped you. You grew up with a strong insistence on respecting elders, attending family events, or learning your parents’ native language and culture. You are close to grandparents and extended family who have taught you how teamwork can help everyone thrive. You have had to face difficulties that stem from your parents’ values being in conflict with yours or those of your peers. Teachers have not always understood the elements of your culture or outside-of-school situation and how they influence your performance. You suffered from discrimination and succeeded s in spite of the discrimination, because of your values and character. You learned skills from a lifestyle that is outside the norm – living in foreign countries as the child of diplomats or contractors; performing professionally in theater, dance, music, or sports; or communicating with a deaf sibling. And remember, it’s not just about who your parents are. It’s about who you are – at the core. Your background, your influences, your religious observances, your language, your ideas, your work environment, your community experiences – all of these factors come together to create a unique individual, an individual who can contribute to a diverse class and a diverse world. Your answer to the diversity question should focus on how your experiences have built your empathy for others, your resilience, your character, and your perspective. Whether the school asks you how you think of diversity or how you can bring or add to the diversity of your school, chosen profession, or community, make sure you answer the specific question posed. Your response should highlight a distinctive you that will add to the class mosaic every adcom is trying to create. Adcoms want each student to add to the overall picture. You don’t want to blend in; you want to stand out but also complement the school’s canvas. Identity: Who are you? What has contributed to your identity? How do you distinguish yourself? Your identity can include any of the following: gender, sexual orientation, ethnicity, disability, religion, non-traditional work experience, non-traditional educational background, multi-cultural background, and family’s educational level. Any or all of these could be unique. Also, what life-derailing, throw-you-for-a-loop challenges have you faced and overcome? Ideas: How do you think? How do you approach things? What drives you? What influences you? Learn more about this three-part framework in this blog post. Think about each question and how you could apply your diversity elements to the classroom, your school, or your community. Any of these elements will serve as the framework for your essay. But don’t worry if you can’t think of something totally “out there”! You don’t need to be a tight-rope walker living in the Andes or a Buddhist monk from Japan to pass the diversity test! And please remember, the examples I have listed are not exhaustive. There are many other ways to show diversity! All you need in order to write successfully about how you will contribute to your school’s diverse population is to have lived on this planet — and then examine your identity, deeds, and ideas with an eye towards your own distinctiveness and individuality. Want to ensure your application demonstrates the diversity that your dream school is seeking? Work with one of our admissions experts and download our FREE Diversity Checklist. This checklist includes 30+ different ways to think about diversity to jump-start your creative engines.